Then LibDem Leader of Stockport Council sends me gloating email when sick, innocent protester wrongly found guilty and imprisoned (later acquitted) and encloses Crown Prosecution Service copy of bail notice. How did he get hold of it and why send it to me? At that time I had no authority to act on Mr Parnell's behalf. Mr. Parnell was charged with breaching the ASBO on 16 th and 17 th July 2009 by entering the Town Hall. He appeared at Stockport Magistrates Court from custody on 18 th July 2009. He was apparently adamant that he would not abide by bail conditions and so was remanded in custody to Forest Bank to appear today. He did appear today. He pleaded not guilty and elected Crown Court trial. His next appearance is before the Magistrates on 14 th September 2009. Today his solicitor applied for bail which was opposed by the CPS. The Magistrates did grant bail. 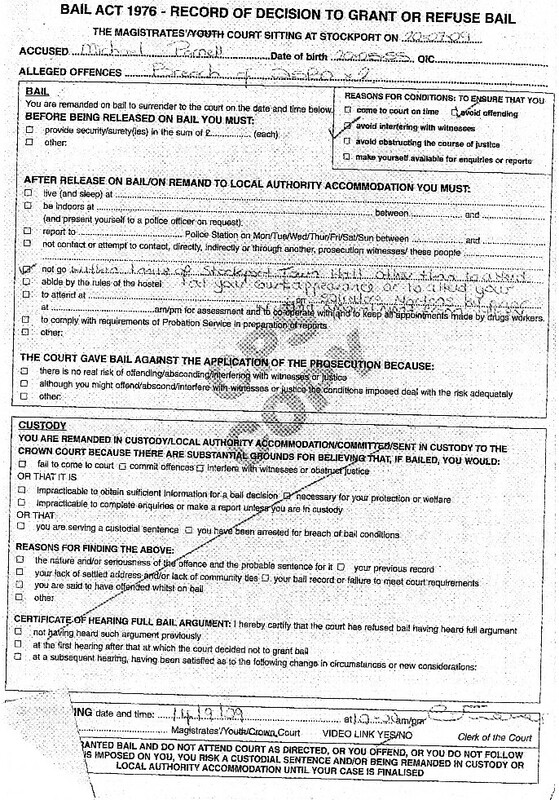 I have attached the actual bail notice. His condition is not to come within 1 mile of the Town Hall. The only exception is when he is appearing in court or by prior written appointment made by his solicitor. There is no exception for attendance at any meeting within that exclusion zone and that was made clear to him. These conditions appear to be unambiguous. It is fair to say that Parnell was less than enthusiastic about these conditions. Ps, Glad you enjoyed the Stepping Hill by-election it makes it all worth it.